Toll gates were used as a method of taxing the road user to fund the maintenance and upkeep of the roads, attached were their associated toll houses. Toll houses were usually small white cottages built with their windows overlooking the roads that they took ‘gate money’ from. It was also the abode of the toll keeper and his family. The charges and costs for use of the road were usually displayed on a large board placed in a prominent position on the side of the building. A classic example of a toll gate can be seen at the Welsh Folk museum at St Fagans. Toll Gate charges as displayed on the side of the house. Hover over image for zoom. Roads still had to be maintained, tolls had to be charged and prosecutions were taken out against those people who eluded or evaded payment. In November 1868 James Francis of Carnarvon Farm, Llanelly, was charged with driving a flock of sheep off from the Turnpike road into a field at Cwmfelin Bar. It was recorded that the ‘defendant had done the same trick many times before’. Nevertheless, he was fined £1 and costs or seven days jail [d]. In July of 1882, Morgan Saunders was fined eighteen pence with costs of £1-8-6 for avoiding the payment of tolls at the Furnace Toll Gate. [e] But the end of the gates was nigh! It must be obvious to all that the admitted cost of collection of tolls, amounting to 15 per cent. apart from possible loss through misappropriation, is in itself a heavy and unproductive expenditure, and that also in the maintenance of the toll houses and of separate staffs of Clerks, Surveyors and Treasurers, there is a considerable outlay, much of which could be saved, if the management of the roads within their respective districts were transferred to the Highway Boards. It may be assumed that scarcely a singular occupier does not now pay in tolls an amount equal to a 1d. Rate. Was Llandafen Toll Gate attacked by Rebecca? 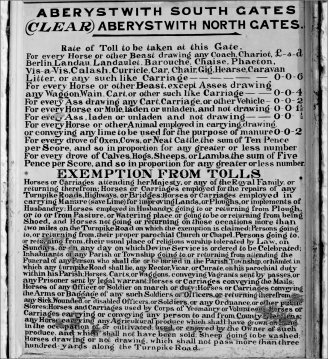 Although the Rebecca attacks on the Sandy, Furnace, Tyrfran and Hendy gates are well documented in official government records and local newspapers, to date, nothing can be found to substantiate any such assault on the Llandafen Toll Gate at Halfway. The old toll house at Halfway has survived for over a century and a half, the building has undergone structural changes, perhaps the most significant being the demolition of the distinctive front vision bay that was uniquely associated with toll houses. Today the newly renovated Llandafen Toll House stands as a tangible link with Llanelli’s past, the turnpike road system and the Rebecca of long ago. [a] Gates at Old Road (Hen Gât) Old Llanelly John Innes, 1902 p91 (map) . Island Place, Island House, Howell’s Plan 1814.;‘Hen Gȃt below ‘Cae Halen’, Stepney Plan and Board of Health Plan. [c] Report of the Commissioners of Inquiry for South Wales 1844 H.M.S.O. [h] Llanelly Mercury 11 March 1915.